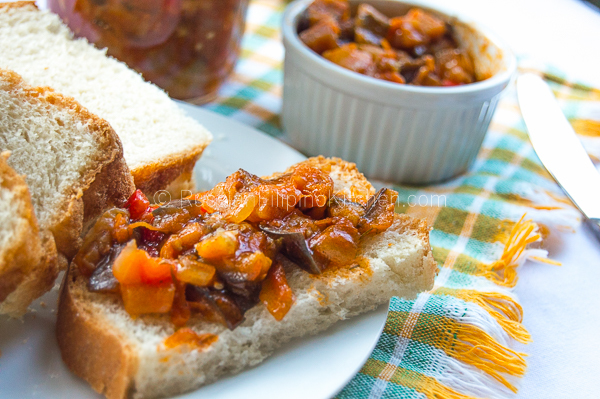 The first time I tried this Russian-style eggplant spread from my mom-in-law, I was hooked! I had to ask for its name– “Ikra”, also known as poor man’s caviar or simply eggplant spread. The word “caviar” brings to mind a picture of tiny, salty, black fish (sturgeon’s) eggs spread on top of crusty bread that, according to my husband, costs $300 for a 2-oz tin. I’m guessing it’s one reason why “ikra” recipes came out. In Russia, poor people had to improvise with whatever ingredients they have on hand. 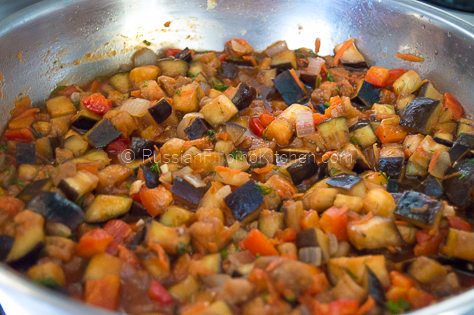 Since eggplants are common fruits/vegetables, they became one of the main ingredients for the dish, together with bell peppers and tomatoes. I came up with this recipe actually by figuring out the ingredients myself from a jar of homemade ikra I got from my in-law’s some time ago. I never got the chance to ask the recipe from her due to language barrier, and my husband’s forgetfulness. My husband often acts as my translator when I wanted to get a certain recipe from his mom. But his schedule is always so hectic, that a trivial request like recipe translation is often overlooked. Anyway, I tweaked and experimented until I got the right taste and I’m happy with the result. I usually make this recipe in batch and can them, as they taste much better when they sit longer. If you don’t do canning, just place them in a glass jar with tight-fitting lid and always use a clean spoon to scoop the ikra out. They’re good in the fridge for up to two weeks. This makes a great appetizer as topping for bread and also perfect as a side dish (my favorite) and eat it with pasta or rice. 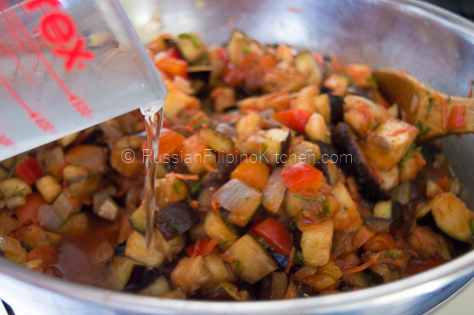 Note: I also have a different ikra recipe, the one that you roast the eggplants first and then puree the finished spread for a finer texture. But that’s going to be in another post the future. 1. 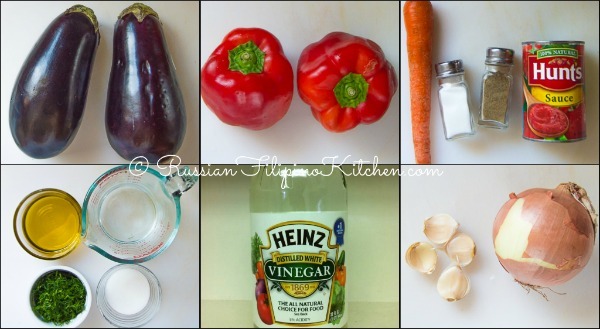 Wash eggplants and pat dry with a paper towel. Slice across lengthwise into ½ inch thick, and cut into ½ inch cubes. 2. Place in a colander and add 2 teaspoons salt. Mix using your hands until salt is evenly distributed. Set aside for 15 minutes to “sweat” and to remove most of the bitterness. 3. Meanwhile, prepare the rest of the ingredients. Wash bell peppers. 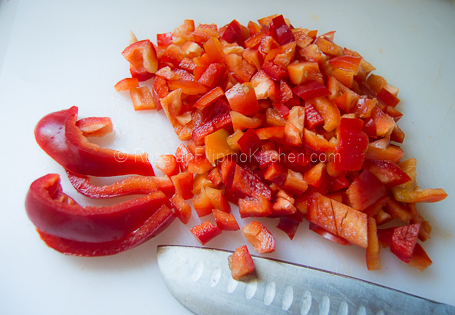 The best and easiest way to cut bell-peppers is to slice the sides first leaving the center with the core and seeds. 4. Slice bell peppers into ½ inch strips then dice into ½ inch. 5. 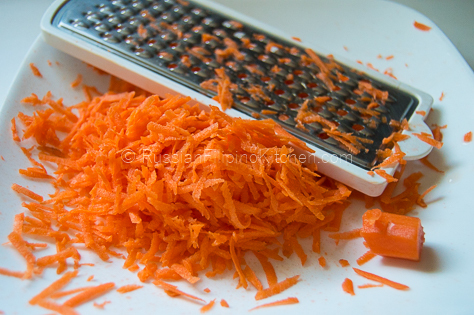 Peel carrot and grate. 6. Peel onion and chop. 7. Peel garlic and mince. 8. 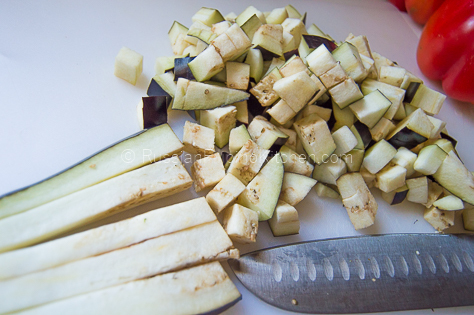 After at least 15 minutes has passed, rinse eggplant cubes under cold running water. Use fingers to evenly rinse everything and remove most of the salt and seeds. Set aside to drain. 9. Heat a large sauté pan or cooking pot under medium high heat. 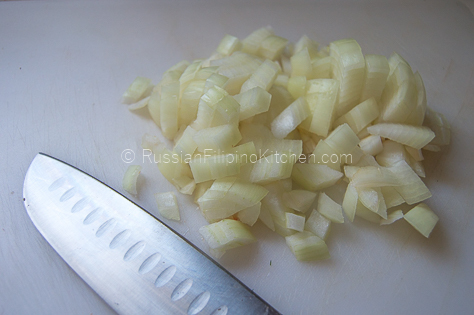 Add olive oil and sauté onions and garlic for 4 minutes, until onions are translucent and garlic turned slightly brown. 10. 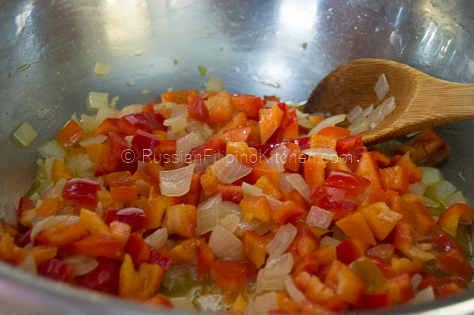 Add the bell peppers and sauté for 2 minutes until slightly limp. 11. 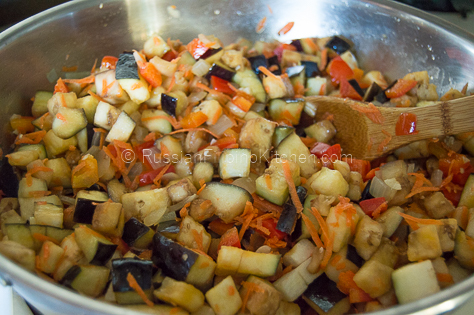 Add eggplant cubes and grated carrots into the pan and sauté for 5 minutes until eggplant has softened. 12. 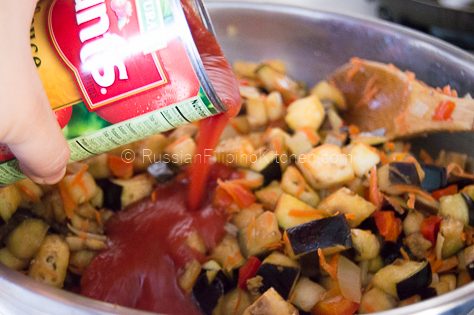 Pour in a can of tomato sauce. Mix. 13. Add dill, salt, ground black pepper, vinegar, and white sugar. Mix. 14. Pour 1 cup water. 15. Cover pot and bring to a boil. Simmer under medium low heat for 45 minutes stirring occasionally until the eggplants and bell peppers are very soft and most of the liquid has evaporated. 16. Remove from heat and allow to cool before serving. 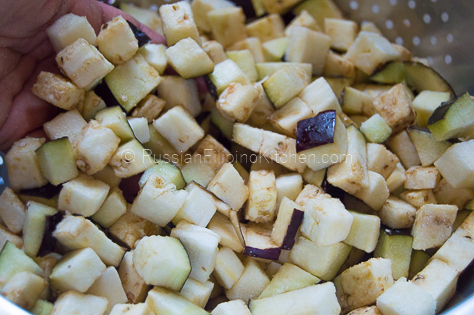 Wash eggplants and pat dry with a paper towel. Slice across lengthwise into ½ inch thick, and cut into ½ inch cubes. Place in a colander and add 2 teaspoons salt. 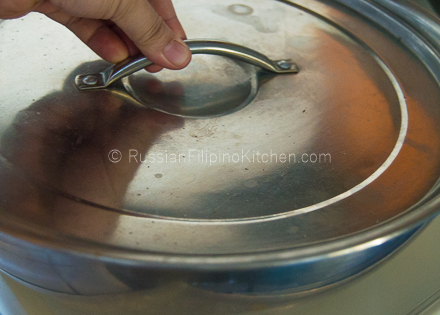 Mix using your hands until salt is evenly distributed. Set aside for 15 minutes to “sweat” and to remove most of the bitterness. Meanwhile, prepare the rest of the ingredients. Wash bell peppers. 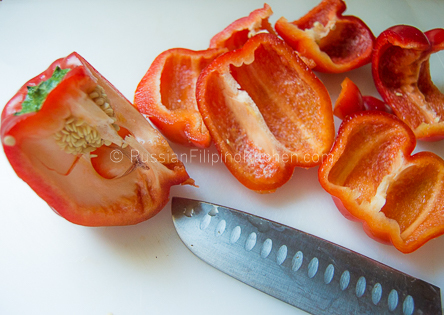 The best and easiest way to cut bell-peppers is to slice the sides first leaving the center with the core and seeds. Slice bell peppers into ½ inch strips then dice into ½ inch. 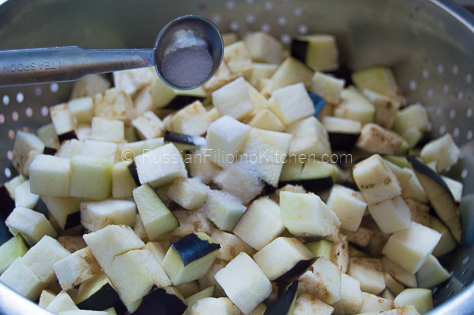 After at least 15 minutes has passed, rinse eggplant cubes under cold running water. Use fingers to evenly rinse everything and remove most of the salt and seeds. Set aside to drain. Heat a large sauté pan or cooking pot under medium high heat. 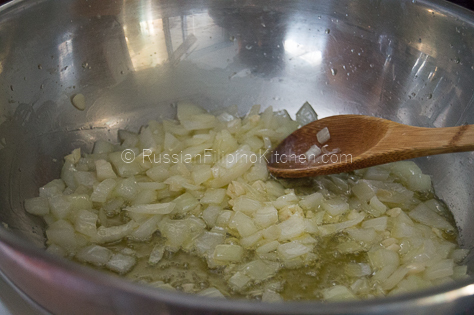 Add olive oil and sauté onions and garlic for 4 minutes, until onions are translucent and garlic turned slightly brown. Add the bell peppers and sauté for 2 minutes until slightly limp. 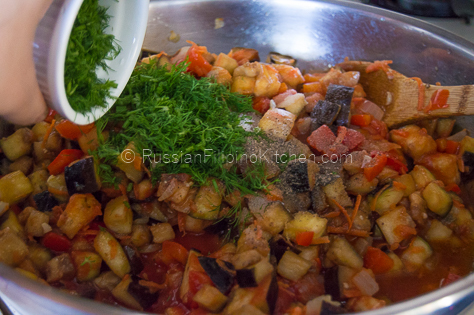 Add eggplant cubes and grated carrots into the pan and sauté for 5 minutes until eggplant has softened. Pour in a can of tomato sauce. Mix. Add dill, salt, ground black pepper, vinegar, and white sugar. Mix. Cover pot and bring to a boil. Simmer under medium low heat for 45 minutes stirring occasionally until the eggplants and bell peppers are very soft and most of the liquid has evaporated. Ooooh! I think I’ll try this one. Looks so yummy! Are you able can this? Would I just process this like any another relish? Yes, that’s correct. I usually place them in sterilized canning jars, and process in boiling water bath for 10 minutes.